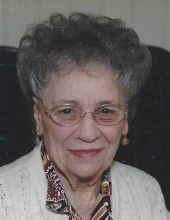 Jennie Noreuil, 98, of Hopedale formerly of Pekin passed away peacefully surrounded by her loving family on Saturday, August 25, 2018 at 12:25 p.m. in Hopedale. Jennie was born on December 28, 1919 to Batista and Caterina Conterio in Standard, IL. On August 10, 1940 she married Antone Noreuil in Carlinville, IL; he preceded her in death on December 16, 1993. Together they had three children whom she is survived by, Larry (Cynthia) Noreuil of Hopedale, Stephen (Patricia) Noreuil of Morton and Paulette Weghorst of Tremont; along with ten grandchildren; sixteen great-grandchildren and six step-grandchildren. Jennie was a member of St. Joseph Catholic Church, The Altar and Rosary Society as well as Ladies of Columbus. Visitation will be at Abts Mortuary in Pekin on Wednesday, August 29, 2018 from 5 p.m. to 7 p.m. with reciting of the rosary at 4 p.m. Her funeral mass will be held on Thursday, August 30, 2018 at 11 a.m. at St. Joseph Catholic Church in Pekin. Burial will follow the mass at St. Joseph Catholic Cemetery in Pekin. In lieu of flowers memorial may be made to St. Jude or Hopedale Nursing Home in her name. A special thank you to the staff at the nursing home who cared for her with such love and compassion. To send flowers or a remembrance gift to the family of Jennie Noreuil, please visit our Tribute Store. "Email Address" would like to share the life celebration of Jennie Noreuil. Click on the "link" to go to share a favorite memory or leave a condolence message for the family.